The Enclave at Upper Makefield in Newtown, Pennsylvania is a 55+ community situated in Bucks County. This active adult community offers homebuyers new carriage homes throughout 96 home sites. Residents of this charming neighborhood enjoy their carefree lifestyles in a picturesque location. 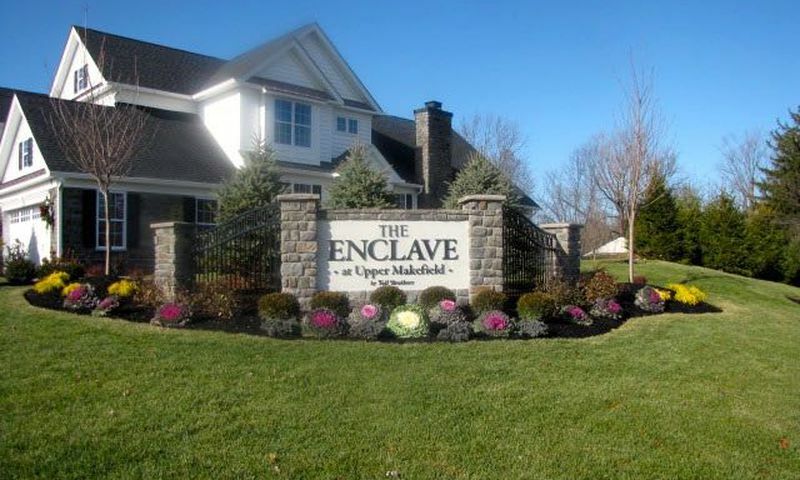 The Enclave at Upper Makefield is a scenic community where residents can walk or jog along trails on a warm summer day. With just under 100 homes, homeowners will enjoy knowing their neighbors within a tight-knit neighborhood setting and can plan events or activities based on shared interests. Construction of The Enclave at Upper Makefield began in late 2014 and upon the community's completion will encompass 96 carriage homes. These attached residences were designed with the active adult in mind. All seven models include open layouts with a basement, large master suite and gourmet kitchen. 55+ homebuyers can find a new construction home that has between 2,324 and 2,717 square feet of living space. These floor plans offer many options with three to four bedrooms, two-and-a-half bathrooms, and an attached two-car garage. Active adults enjoy living in a luxurious lock-and-leave home where exterior home maintenance is handled. Snow removal, landscaping, and lawn care are all provided, therefore homeowners have more time to travel, pick up new hobbies, or explore local attractions. Located within Bucks County, The Enclave at Upper Makefield is situated on Hillyer Lane, at the northwest intersection of Creamery and Stoopville Roads. Easy access to major roadways like Interstate 95 makes it easy to drive to Trenton, New Jersey and Philadelphia in less than 45 minutes. Those who enjoy traveling will be pleased to know that they can drive to the Philadelphia International Airport is less than an hour. Closer to home, residents will enjoy shopping, dining, and touring Peddler s Village. Here you will find specialty shops, a diverse selection of restaurants, and everyday necessities. New Hope is a neighboring city where residents can enjoy a day at Buckingham Valley Vineyards & Winery, enjoy live entertainment at Bucks County Playhouse, or visit Rice s Market during the warmer months. The Enclave at Upper Makefield is a wonderful 55+ community in Bucks County, PA that enjoys a quiet setting in a convenient area. Check back soon for more information on the lifestyle in The Enclave at Upper Makefield. The Enclave at Upper Makefield will include 96 attached carriage homes upon completion. Homebuyers can find a new construction home that includes three to four bedrooms, two-and-a-half bathrooms, and an attached two-car garage. There are seven models that range in size from 2,324 to 2,717 square feet. Every home includes a full basement and first-floor master suite. 55places.com is not affiliated with the developer(s) or homeowners association of The Enclave at Upper Makefield. The information you submit is distributed to a 55places.com Partner Agent, who is a licensed real estate agent. The information regarding The Enclave at Upper Makefield has not been verified or approved by the developer or homeowners association. Please verify all information prior to purchasing. 55places.com is not responsible for any errors regarding the information displayed on this website.